A study by engineers at Oregon State University suggests that they have achieved the most realistic robotic implementation of human walking dynamics that has ever been done, which may ultimately allow human-like versatility and performance. The system is based on a concept called "spring-mass" walking that was theorized less than a decade ago, and combines passive dynamics of a mechanical system with computer control. It provides the ability to blindly react to rough terrain, maintain balance, retain an efficiency of motion and essentially walk like humans do. As such, this approach to robots that can walk and run like humans opens the door to entire new industries, jobs and mechanized systems that do not today exist. The findings on spring-mass walking have been reported for the first time in IEEE Transactions on Robotics, by engineers from OSU and Germany. The work has been supported by the National Science Foundation, the Defense Advanced Research Projects Agency and the Human Frontier Science Program. The technologies developed at OSU have evolved from intense studies of both human and animal walking and running, to learn how animals achieve a fluidity of motion with a high degree of energy efficiency. Animals combine a sensory input from nerves, vision, muscles and tendons to create locomotion that researchers have now translated into a working robotic system. "I'm confident that this is the future of legged robotic locomotion," said Jonathan Hurst, an OSU professor of mechanical engineering and director of the Dynamic Robotics Laboratory in the OSU College of Engineering. "We've basically demonstrated the fundamental science of how humans walk," he said. "Other robotic approaches may have legs and motion, but don't really capture the underlying physics," he said. "We're convinced this is the approach on which the most successful legged robots will work. It retains the substance and science of legged animal locomotion, and animals demonstrate performance that far exceeds any other approach we've seen. This is the way to go." The current technology, Hurst said, is still a crude illustration of what the future may hold. When further refined and perfected, walking and running robots may work in the armed forces. As fire fighters they may charge upstairs in burning buildings to save lives. They could play new roles in factories or do ordinary household chores. "Robots are already used for gait training, and we see the first commercial exoskeletons on the market," said Daniel Renjewski, the lead author on the study with the Technische Universitat Munchen. "However, only now do we have an idea how human-like walking works in a robot. This enables us to build an entirely new class of wearable robots and prostheses that could allow the user to regain a natural walking gait." There are few limits to this technology, the researchers said. "It will be some time, but we think legged robots will enable integration of robots into our daily lives," Hurst said. "We know it is possible, based on the example of animals. So it's inevitable that we will solve the problem with robots. This could become as big as the automotive industry." And much of this, the scientists said, will be based on the "spring-mass" concept, which animals have been perfecting through millions of years of evolution. 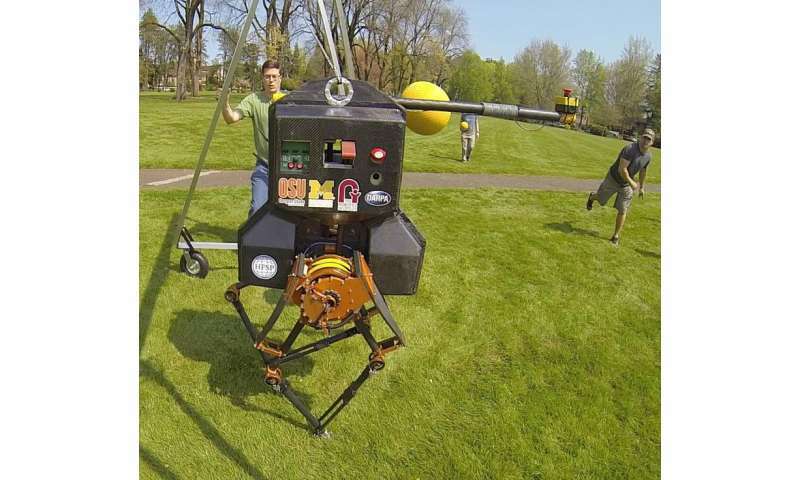 The robots being constructed at OSU were designed to mimic this "spring-legged" action of bipedal animals. With minor variations, muscles, tendons and bones form a structure that exhibits most of the required behavior, and conscious control just nudges things a little to keep it going in the right direction. The effort is smooth and elastic, and once understood, can be simulated in walking robots by springs and other technology. Researchers said in their new study that this technology "has the potential to enhance legged robots to ultimately match the efficiency, agility and robustness of animals over a wide variety of terrain." In continued research, work will be done to improve steering, efficiency, leg configuration, inertial actuation, robust operation, external sensing, transmissions and actuators, and other technologies.